I Know You Love Home Tours! 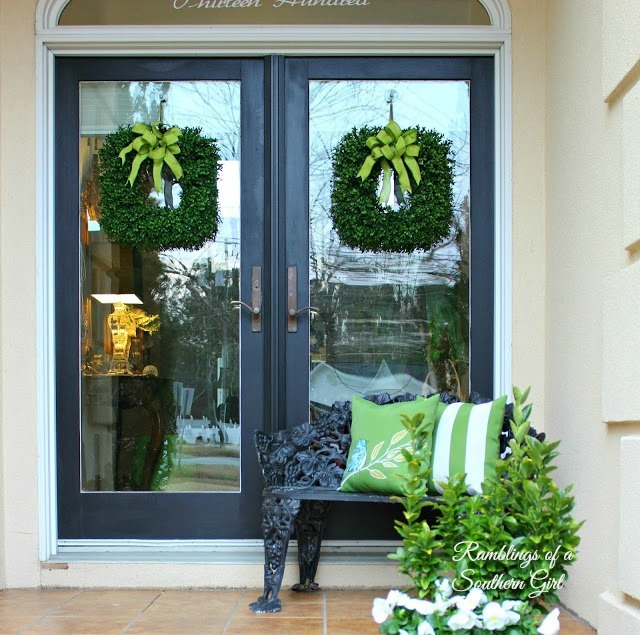 Rhonda at Ramblings of a Southern Girl has one of the prettiest porches to welcome friends and family. She welcomed us to tour her home and it was gorgeous! Rhonda is always crafting and decorating. I love to see what she does. In September, Coco of The Crowned Goat allowed me to share her home. Coco is one of the sweetest bloggers! Her whole family is involved in the DIY antics at her house. You girls loved @ourcraftsmancottage! How could you not love it? This is a DIY haven filled with beautiful details. Thanks to Sonja for sharing and be sure to find her on Instagram. And can we all just take a moment to sigh about this red door and green lawn? 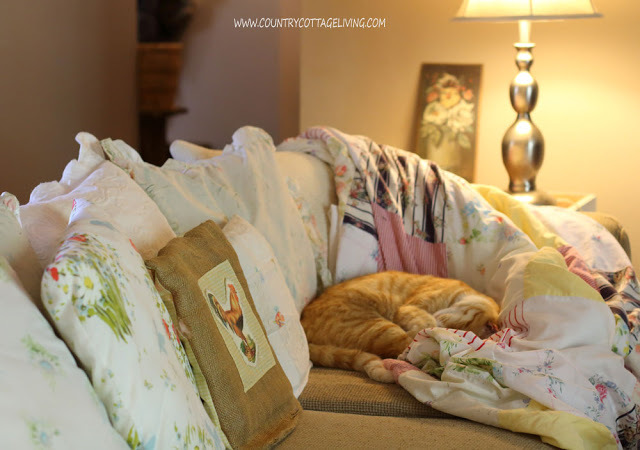 Suzanne at Daffodil Hill has a wonderful, traditional home that makes me swoon! We were reminded that "more is not always better" at Camellia Cottage. Melanie's beautiful photography is such a treat. Lidy's French Garden House is one I return to again and again. You do too! We all love the beautiful French country touches that are so perfect in her California cottage. 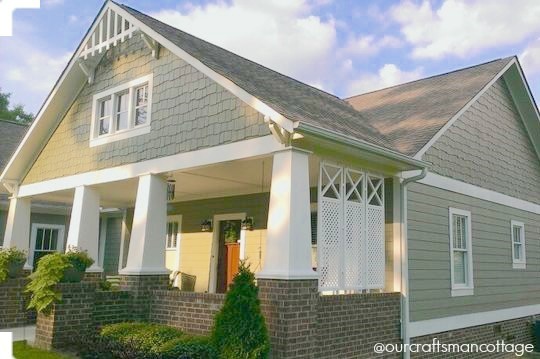 Farmhouse decor is all the craze but Cathy's home at Cobblestone Farms is the real thing. I've been blog friends with Cathy for a long time and watching her grow things and build this farmhouse has been so inspiring. Carol's whole entire house is amazing but the kitchen is where it's at because she's a real chef. 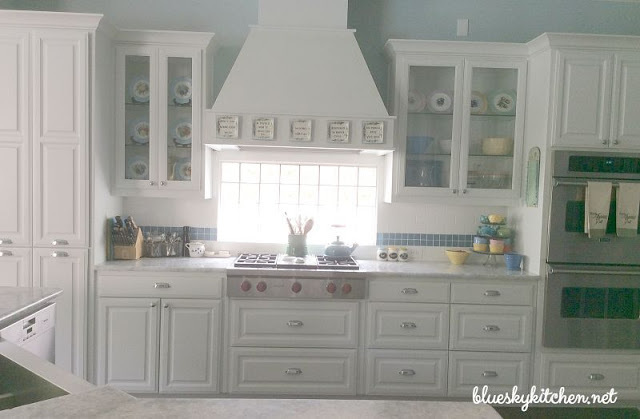 If you want delicious but friendly recipes, furniture painting ideas, and more visit her at Bluesky Kitchen. You can't help but be drawn to Janine's light and bright home at the Happy Happy Nester. When you visit her blog you'll be treated to sunshine, beauty, and a positive attitude. The very first First Friday Home Tour featured House by Holly. Holly calls herself an "upcycling warrior". I love that! I'm so glad you like home tours as much as I do. We will begin with a fresh line up in February. I have big plans for this year! :) Hey readers....if you don't have a blog but would like to be considered, just shoot me an email. 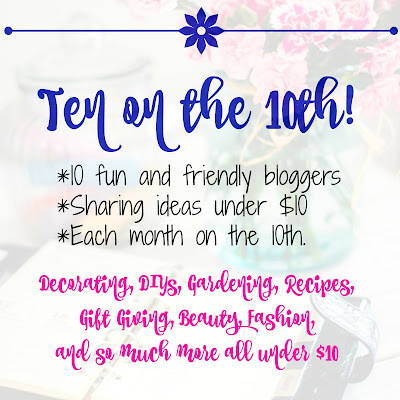 stacey@poofingthepillows.com One more thing... Be sure and join me here on the 10th where I'll be joining with some friends to share new ideas all under $10! 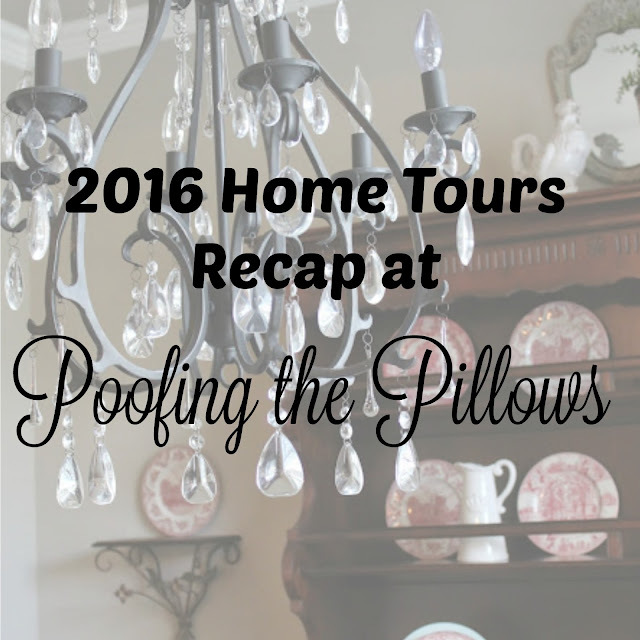 Home tours make my heart sing! Thanks girl, Hapoy Weekend!! 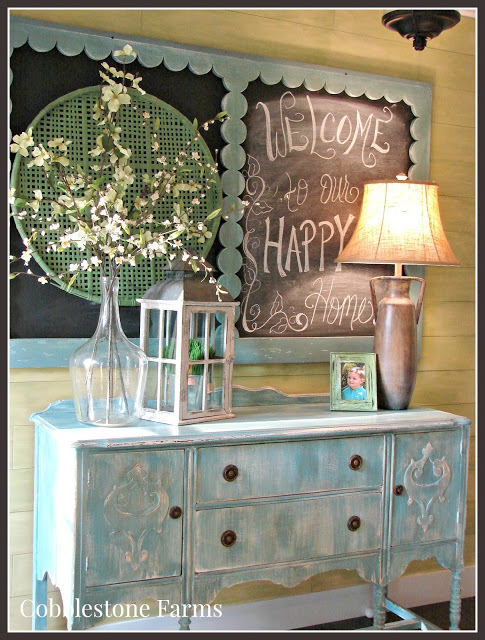 Yep, I am a home tour loving gal! Happy New Year, Stacey! Yes ma'am, count me in as I love these home tours! Here's to the best for you and yours in this new year! I could look at home tours and watch puppy videos all day long. Can't get enough of them. Hope you have a wonderful weekend, dear Stacey. Amazing tours. Always fun to revisit them. All so fresh and filled with light and joy! I'm glad you brought some of these back. I love home tours! Thank you. Yes! I love home tours, and enjoyed seeing the homes you featured. Stacey, thanks for the recap! Especially since I missed a few of those the first time around. Now I can go back and check them out. 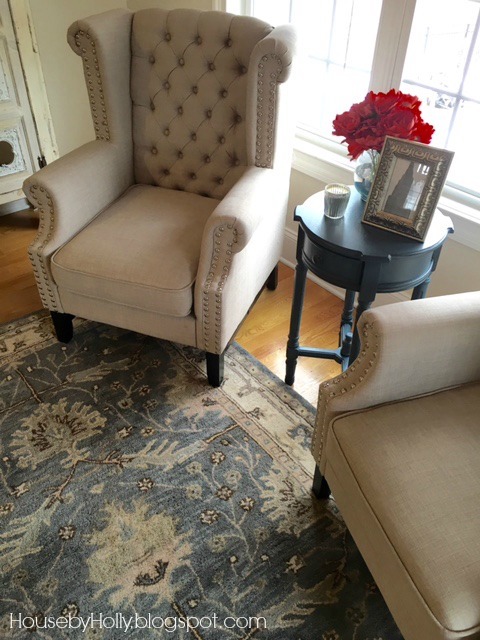 I *love* home tours and before and afters! So many pretty houses and each one is worth another look! :) More please! The home tours are fun, especially relevant when readers (like me) are on the threshold of some big projects. Thanks, Stacey. There is so much decorating talent out there and I just love to absorb it all in! Looking forward to the tours this year and to the 10 ideas next week. Happy Weekend! We all love a good home tour. I know I sure do! Looking forward to the next round! Thank you Stacy for sharing these wonderful homes with us and of course a huge thank you to each of the bloggers whose homes you shared. Love these home tours. So much pretty to look at on these cold shut in days. Thanks for sharing. Love the home tours, don't we all love to see behind the doors! Everyone loves peeking into others homes! 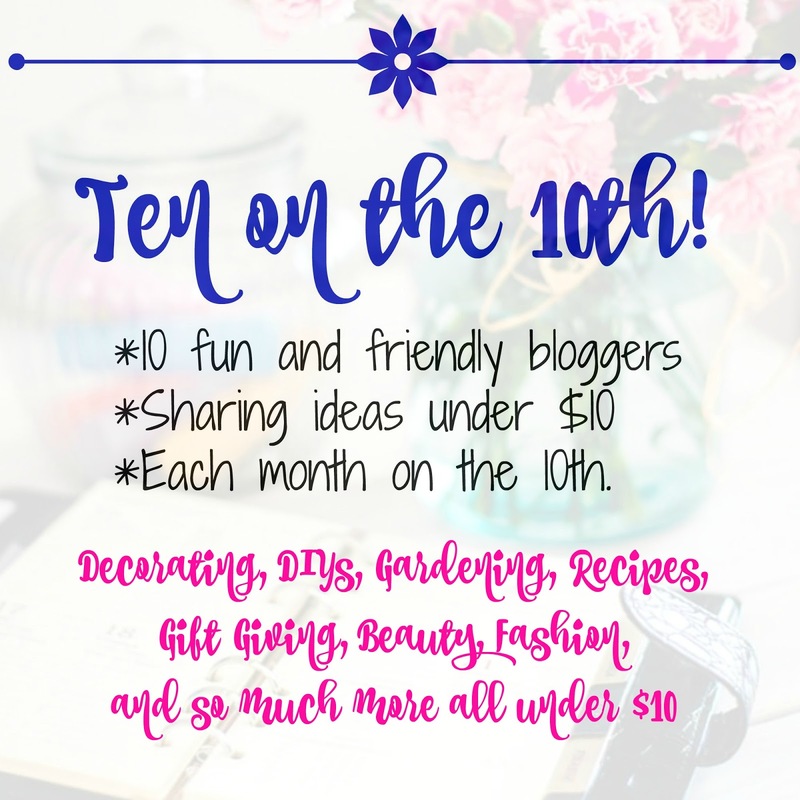 I'm looking forward to under 10 on the 10th! Home tours are indeed so wonderful. I always glean such good ideas. This is such a fun series. Such a great way of seeing other Blogger's homes. I love touring homes. Thank you Stacey for sharing an also for linking up to Dishing It & Digging It. I wanted to let you know your top Posts for 2016 is being featured today at our link party. Happy Sunday. 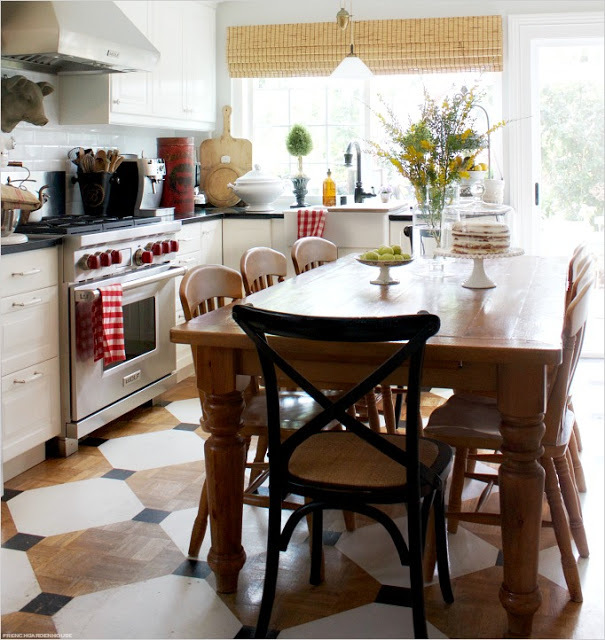 I love your home tours, Stacey, and I'm swooning over Lidy's kitchen...sigh! Happy New Year to you and I'm impressed by your word for 2017. You go girl! Beautiful homes indeed! Thanks for sharing at Home Sweet Home! Ooh! I do love a good home tour! This year I need to focus on my front porch, and while I'm at it, rethink my front door. That red one is calling my name. Hi Stacey! Sure hope your new year is going well so far - and is filled with peace, laughter and lots of fun! I need to go back and look again at those wonderful featured homes - oh how I love love love home tours! Thanks for making it happen! Each and every one of them was just delightful Stacey! I love that these ladies have opened up their homes to us. Thanks for taking the time to share these beauties with SYC. I always love seeing your home tours, Stacey... so pretty! Hope you're having a great week, Stacey! Stacey, I drool over home tours and look for something I might be able to take away from some of them. These are awesome and I LOVE them all! Keep bring them on, my friend! created for you by our experts. we have a tendency to bring the world's best to our doorstep. welfurn is leading Interior design company that gives exquisite styles excellence in producing and Quality standards. will give door-step delivery and can complete the installation at your home.